My Top Ten Favorite Episodes of Star Wars Rebels Season 4 – I'd Rather Be Geeking! Heroes of Mandalore was a really good place to start season four. In this episode, Sabine’s story wrapped up and another Clone Wars character returned! That character was none other than Bo-Katan Kryze herself! If you don’t know her, Bo-Katan used to be in a Mandalorian terrorist group called Death Watch. Of course, she’s changed her ways and had become a whole lot wiser since then. Back to Sabine, we finally got to see her father in this episode! Her whole family was back together! We also saw that Sabine had built a terrible weapon for the Empire in the past. The Duchess, named after the Mandalorion duchess, Satine Kryze (Bo-Katan’s sister), was capable of literally disintegrating human beings. Yikes! Sabine finds that the Empire has a prototype of her weapon when it is used on her people, and nearly caused the death of her mother and brother. In the end, Sabine was able to use her weapon against the Empire and destroy it. Can you imagine if the Empire had mass produced those things? Scary! Oh boy! This episode introduced us to the white Loth-wolf, and sent Star Wars Rebels on a more mysterious path. I have been trying to figure those wolves out forever! But I guess some things are best left mysterious! This episode also showed us Thrawn’s new TIE Defender, and it did not disappoint. It would have been really bad for the Rebellion if those TIEs were mass produced. Sabine and Ezra were able to steal the TIE Defender prototype’s hyperdrive and flight data recorder to bring it back with them. The soundtrack for this episode was wonderful! I love the white wolf’s theme! In this episode things on Lothal got a lot more interesting. Star Wars Rebels’ season four mid-season finale finally had the rebels make an attempt to save Lothal. Things, of course, didn’t go as planned. In fact, it ended in total failure. They lost everything trying to save Ezra’s homeworld. Thrawn sent TIE Fighters to wreck Hera’s fleet of X-Wings, and he succeeded. Rukh was sent out to capture any surviving rebel pilots, resulting in the capture of Hera. 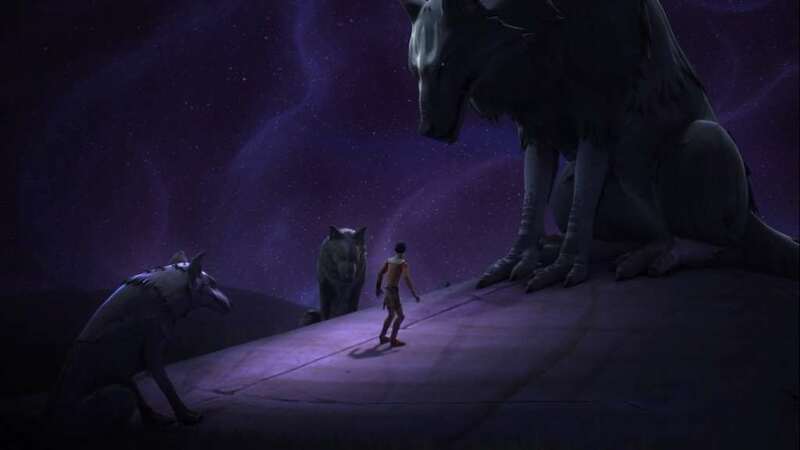 Kanan, on his way to help Hera, was stopped in the middle of the road by the white Loth-wolf. The wolf told him what he needed to do, but of course we were made to wait until February to find what was in store for Kanan Jarrus. What a horrible wait that was! This episode was an interesting one! 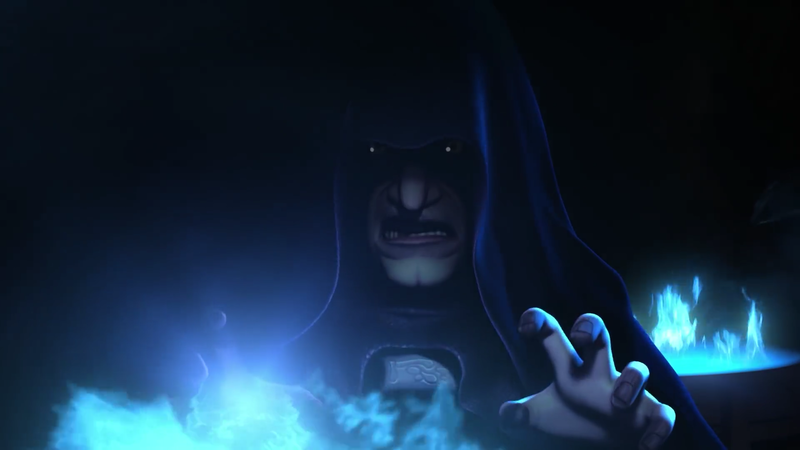 Loth-wolves, Mortis Force Users, Emperor Palpatine himself! The best part has got to be when that wall painting started to move! Oh, it was great! Mortis obviously has some connection to Lothal. A few days ago I was watching the Clone Wars’ Mortis ark and I saw things I never noticed before. For instance, on the temple ceiling there is constellations of wolves. I will probably do an entire post on this later. Anyway, the crazy parts in the episode were cool, but it’s the little moments that get to me. When Kanan’s ghostly presence came to Hera, I know some of us got a little teary eyed. It showed that some member of the ghost crew are still understandably hurting after that major death. I always say I’ve never seen this happen in an animated show before. Usually it’s just about forgotten, like, two episodes later. Anyway, we also find that the Emperor is wanting inside the Lothal Jedi temple, but it does not say why in this episode. I’ll get back to that in awhile. The everything in this episode was amazing and I enjoyed every minute of it! This episode was beautifully done. It gave us and the characters a chance to grieve Kanan’s death before jumping into more action. The members of the Ghost crew had different ways of grieving, letting the audience have a character to relate too. Sabine and Zeb lashed out in anger, Ezra isolated himself, Hera began to doubt the Rebellion and blamed herself for the death of the man she loved. Chopper took on the role as the comforter, which I think is really sweet, since we know Chopper to be a grumpy little droid. To be honest, I was sobbing for like, this entire episode. And we can’t forget about the new, HUGE wolf, Dume. That moment when Ezra first meets Dume is incredible! In the end, the rebels are given a new mission, thanks the the help of the wolves. I don’t know about you, but I think dialogue was very well written and the music was beautiful. I still cry if I go back and watch it! 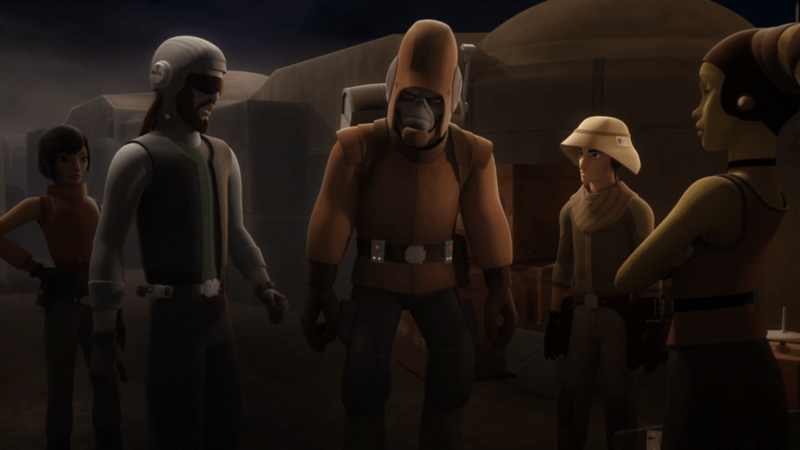 In this episode, the Ghost crew returned to Lothal to find that a lot has changed since they first saw it. The Empire had burned most of the fields away, the blue sky was no longer visible, and the city had been turned into a dump. 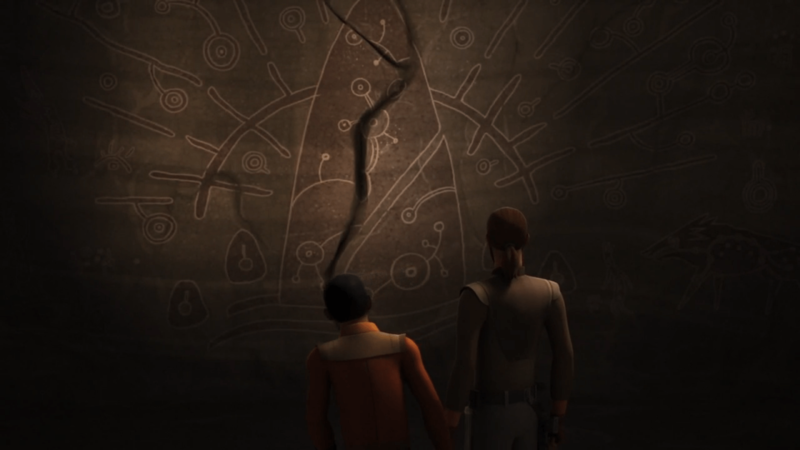 While going through Lothal’s city, Ezra and Sabine got help from a character last seen in season one, Jai Kell. Thanks to Jai, they are able to avoid capture and escape on Ryder’s ship. This episode was very interesting. The Ghost crew even changed up their outfits for disguises! And to be honest, I’ve probably watched it about fifty times already! Star Wars Rebels’ grand finale is so good! I don’t even know where to start! All the rebels joined together to make their last stand for Lothal. And, against all odds, they actually succeeded! Things looked like they were going to get really bad when Thrawn arrived, but thanks to Ezra and the Purrgil, Thrawn was defeated and the rebels were able to set the Imperial Dome to self destruct and send it into the air where it blew up, killing every Imperial on board. Ezra and Thrawn disappeared into deep space, but are thankfully still alive. In the end, this episode time jumps to after Return of the Jedi, where it is revealed that Sabine had stayed on Lothal to protect it, Zeb and Kallus went to live on Lira San, Rex and Hera fought in the Battle of Endor, and Hera ended up having a son, Jacen Syndulla. But just because this episode had a happy ending doesn’t mean that there was no tears when watching this! I literally cry every time I watch the scene where the Emperor tempt Ezra to go through the gateway to live his parents. Every. Single. Time. But anyway, this episodes was the perfect ending for a beloved show. Another great one! Kindred had some strange events happen, but first, I have to mention that this episode marks the first on-screen kiss for Kanan and Hera! *Squeals! * Anyway, in an attempt to escape from Pryce and a new Imperial arrival, Thrawn’s bodyguard Rukh, the rebels follow the Loth-wolves into a cave, where they are strangely transported to the other side of Lothal! Meanwhile, Hera made it back to the Rebel Alliance with the TIE Defender flight data recorder. I really love this episode, and I was so blown away by the wolves. They are so mysterious! Oh. My. Gosh. This episode was AMAZING. I was freaking out the whole time! All those voices in the portal! When Ezra went through the gateway to find that he had control over all space and time. He used this to save Ahsoka Tano’s life. He thought he could save Kanan’s too, but he realized that Kanan had sacrificed his life for his, and that there was an important lesson to be learned. Ezra and Ahsoka were able to escape the gateway just before the Emperor was able to capture them. The scene where Ezra closes the portal is so good. If you listen to the music in that part…oh, it’s great! In the end, we find that the Lothal Jedi Temple has strangely disappeared. I’m really hoping that some of Lothal will be revealed sometime! Star Wars Rebels was a great series with a whole lot of awesome episodes! I have a feeling it won’t be long until the next animated series is revealed. And who knows? It could be about Sabine and Ahsoka going of to find Ezra! That would be cool! Did any of your favorite episodes make the list? Let me know in the comments below! Now, may the Force be with you, and God bless.